Who can use this Principal Designer Appointment? Any developer or individual who is going to build an office, house or other construction project. It is also a useful template for anyone who offers principal designer services. 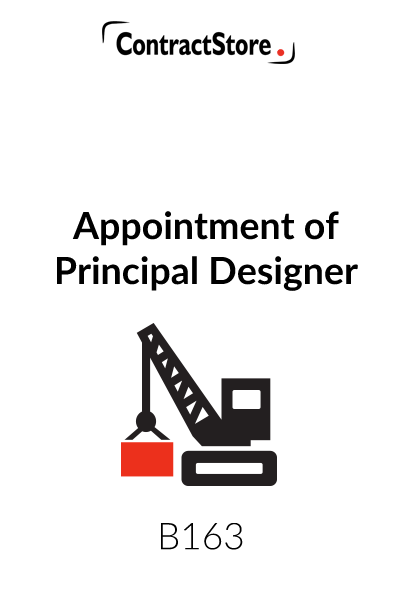 What is this principal designer appointment for? 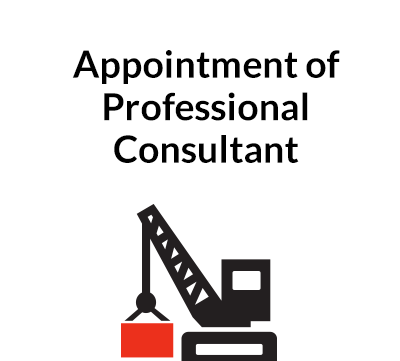 What are the main issues when preparing a Principal Designer Appointment? First, you need to appoint someone who is qualified for the work. The CDM Regulations issued in 2015 set out the requirements. It could be the architect but often the principal designer is a specialist with particular skills for this job. Details of the services are covered in the CDM Regulations and our principal designer appointment template uses these in a schedule. You will also want the principal designer to have adequate professional indemnity insurance. As for fees, this is a matter for negotiation, usually with fees paid in stages. 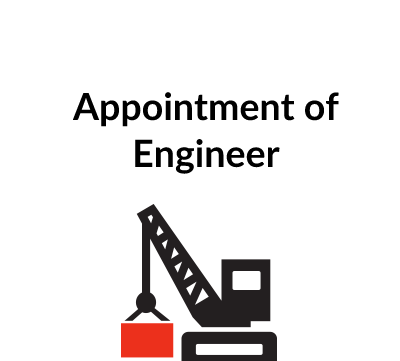 What detailed terms does the Principal Designer Appointment contain? ContractStore supplies templates and is not a law firm. But all our templates are written by experienced lawyers, in this case a specialist construction solicitor. So, we can arrange legal assistance for customers who need special terms in one of our documents or a bespoke template. . For more information see our Legal Services page. Since the introduction of the Construction Design and Management Regulations 2015, the role of CDM coordinator has been replaced by the role of principal designer. The principal designer’s role will be to plan, manage, monitor and coordinate health and safety in the preconstruction phase of a project. The regulations require the principal designer to be a designer who prepares or modifies the design or who arranges for the design to be prepared or modified. Thus, someone who is a health and safety expert but is not involved in the design process would not be qualified to take on the role and the most obvious candidate for the great majority of projects will be the architect. Even if the architect is also appointed as principal designer, there may be a need for two separate appointments, not least because on a commercial project organised on a design – build basis, the architect may be novated to the main contractor, but his role as principal designer would remain a direct appointment from the client. 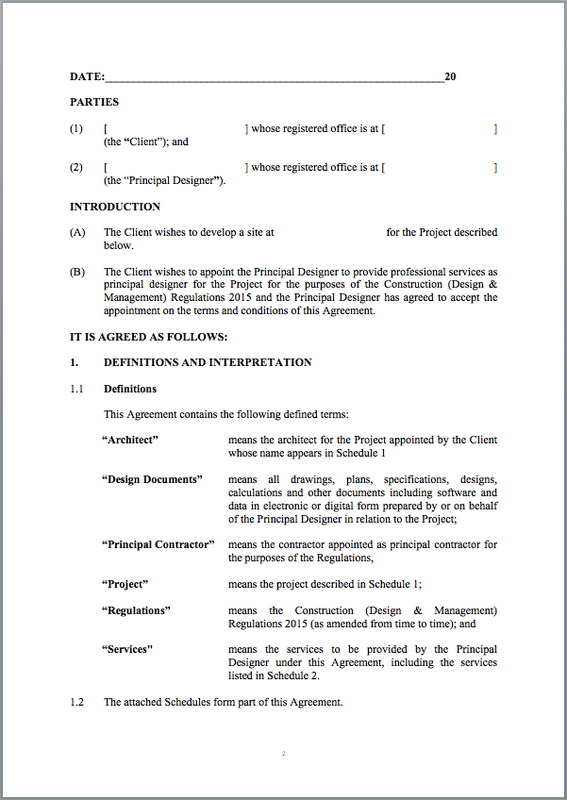 Our form of appointment uses much of the language of the 2015 CDM Regulations, not only in the schedule of services, but also in the body of the document, in particular in the clauses setting out the duties of the principal designer and the client – clause 4 and clause 5. Also, in clause 2, under which the client appoints the principal designer, there is a warranty from the principal designer to the effect that it has the skill and knowledge to fulfil its role, a requirement specified in the regulations. Schedule 1 contains project specific details including a description of the project and certain variables such as the interest rate on late payment, insurance limit, liability limit, adjudicator nominating body etc. Schedule 2 sets out the details of the services and this is largely taken from the wording of the CDM Regulations. Schedule 3 contains details of the fees and expenses and there are alternative possibilities – a fee calculated by reference to the construction cost of the project, a lump sum payable in instalments, or monthly payments by reference to hourly rates. There is scope for additional services in clause 7, the cost and time impact to be agreed before they are undertaken. Clause 9, dealing with professional indemnity insurance, contains a clause limiting the overall liability of the principal designer. Under clause 10 there is potential for the client to require collateral warranties from the principal designer in favour of identify third parties. There are also clauses giving each party the right to terminate the agreement in certain circumstances as well as a suspension clause.